China has overtaken the U.S. as the world's top economy. But in taking a few examples from China, as well as investing in jobs that stay in America and taking steps to insure economic stability for the majority of American workers, the U.S. can come out on top again. And we can do it without having to decimate working people or the environment. Much of the growth China has experienced is through Chinese urban centers becoming more connected than ever due to China's investments in high-speed rail (HSR). Since 2008, China has built 6,800 miles of track for their HSR systems, allowing, for example, the 820-mile distance between Shanghai and Beijing -- roughly the same distance as between Chicago and New York City -- to be covered in just five hours, for less than the cost of a plane ticket. China is also connecting provincial communities in the Western region to major urban centers, giving rural residents easier access to urban jobs. In the 100 Chinese cities that are connected by the HSR network, there hash been a 59 percent increase in market potential, meaning that HSR is making it easier than ever for companies, employees, customers, and new markets to reach one another. By 2020, China will have built 12,000 miles of high-speed rail, with 4 lines going east-west and 4 lines going north-south. The rapid growth of China's economy since 2008 correlates almost directly to the growth of China's HSR infrastructure. The U.S. is currently piloting high-speed rail systems in California, New York, Florida, Michigan, and Illinois. The California rail network, which connects the San Francisco Bay Area to Los Angeles, is expected to create an estimated 450,000 new permanent jobs as a result of HSR car manufacturing, track laying, and maintenance. The New York rail line will connect New York City with Albany, the capital city, along I-87, and major cities along the I-90 corridor all the way to Buffalo and Niagara Falls. The Florida HSR line will connect Miami with Orlando, both of which are urban centers central to Florida's economy. The Illinois line will allow direct, traffic-free travel between Chicago and Saint Louis, which is normally a five-hour drive. That same rail network will connect Chicago to Detroit, shaving 2 and a half hours off a standard drive on the interstate. Existing high-speed rail projects, as well as potential future projects that could connect, for example, Denver to Salt Lake City, or Southern economic hubs like Houston, New Orleans, and Jacksonville to one another, will bring new jobs and business to economically-deprived communities. As The Atlantic pointed out, the most significant economic benefit will come not to major population centers being connected by a non-stop train ride, but to cities several hours removed from major urban centers. Double-digit unemployment in California's San Joaquin Valley would be eased with HSR construction, as new businesses would open to accommodate new workers in the region. Workers in the valley would also have access to more jobs in the Bay Area and Los Angeles thanks to the rail systems. While detractors would point to the high cost of these HSR systems, such as the $68 billion projected cost of California's Los Angeles-San Francisco system, as an economic drain, the projects could easily be funded by two additional taxes that would affect only the top .01 percent of Americans. According to The New York Times, a one percent sales tax on basic financial transactions like stocks, bonds, futures, and options would bring in $350 billion a year. Bringing the inheritance tax back to Clinton-era levels would bring in another $50 billion each year. This combined $4 trillion every ten years would be more than enough to fund high-speed rail construction across America for decades to come. These HSR proposals will take more cars off the road, dramatically decreasing CO2 output in major urban centers if the electricity to run those trains is produced by green energy. California and Florida get lots of sunshine. Flat expanses like Illinois and areas close to water like the Great Lakes Region of upstate New York get plenty of wind. An added benefit is the massive potential for job growth in producing the green energy it would take to power HSR lines. Photovoltaic energy by way of solar panels and wind energy manufacturing is on track to create exponentially more jobs than in the oil and gas sector over the next decade. 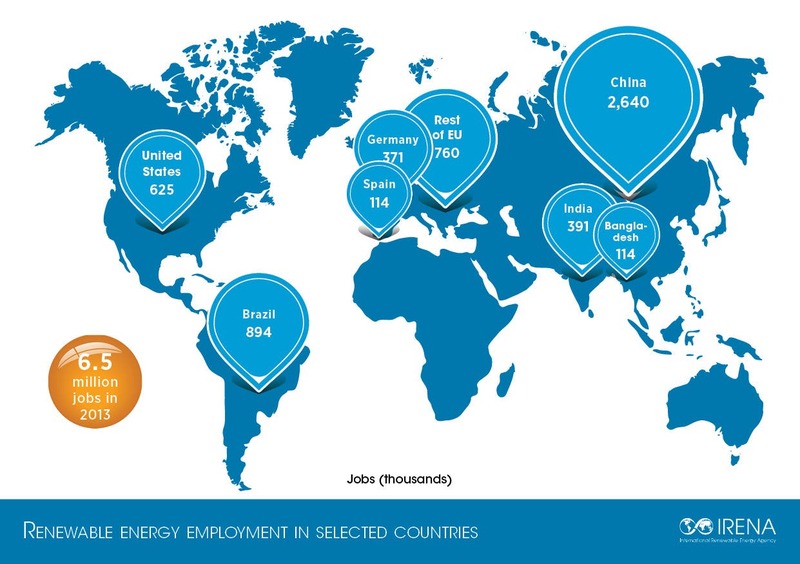 According to the International Renewable Energy Agency, the U.S. employs 625,000 people in the renewable energy sector. China employs 2.6 million. As oil production continues to slow down, those numbers will only grow larger. Over the next several decades, states investing in wind and solar power will experience dramatic job growth in the manufacturing, installation, transportation, and maintenance of wind turbines and solar panels. Prominent investors like Warren Buffett are betting big on the industry's long-term growth, as Berkshire Hathaway has already invested nearly $17 billion in wind, solar, and geothermal energy and aims to double that investment over the next decade. In addition to investment in a nationwide high-speed rail network and green energy, a big economic boost could come from meeting the demands of workers striking for a $15 an hour minimum wage with the right to unionize. The December 4 fast food and retail workers strike, which took place across 190 U.S. cities, was the largest to date, and came on the heels of a nationwide Black Friday strike and boycott campaign that led to Black Friday sales plummeting by 11 percent. Hundreds of thousands of workers have called on their employers, most of which are global corporations making billions in profit, to pay workers a minimum of $31,000 a year, and to grant them the right to collectively organize for fairer working conditions and benefits. And they've demonstrated they have the power to shut the fast food economy down for an entire day in nearly every major American city, costing these companies millions in revenue. If these workers got the raise they were asking for, it would greatly increase the spending power of over a million and a half workers, as those workers immediately spend that money in their local economies. The Bureau of Labor Statistics estimates that 1.6 million workers earned $7.25 an hour, for an annual salary of roughly $15,080, meaning $24.1 billion is cycled into communities. If those same workers made $15 an hour, it would mean $49.6 billion is cycled back into local economies every year - more than double the original economic boost to those workers' communities. This is money that goes directly to local businesses, which would have a need to hire more workers to meet the increased demand. This isn't just speculation, but fact -- businesses that pay workers a living wage are statistically more profitable than those that don't. Costco, which pays workers an average of $20 an hour, is more profitable than Walmart. In-N-Out Burger, which pays a starting wage of $10.50 an hour, is booming while McDonalds pays employees minimum wage and is seeing some of its weakest sales numbers yet. Moo Cluck Moo, a fast food restaurant in Detroit, pays workers $15 an hour and is seeing increased sales and is planning new locations. When a businesses has happy workers, they see a lower employee turnover rate. A lower employee turnover rate means these businesses save money by not having to constantly train new hires. Paying workers a fair, living wage is good for business, and will grow the economy over the long term. It may take a decade or two, but if the U.S. implemented these solutions tomorrow, we would be on track to re-take the top spot in the world's fastest-growing economies. And we could do it while preserving the Earth for future generations and treating working people with the dignity they deserve.